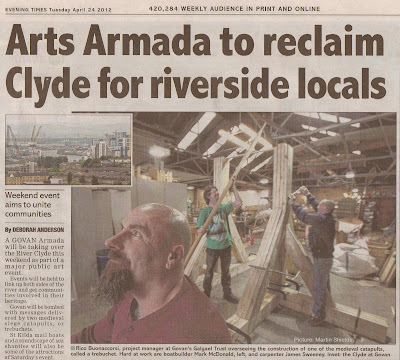 "A Govan Armada will be taking over the River Clyde this weekend as part of a major public art event. Events will be held to link up both sides of the river and get communities involved in their heritage. Govan will be bombed with messages delivered by two medieval siege catapaults, or trebuchets. St. Kilda mailboats and a soundscape of sea shanties will also be some of the attractions at Saturday's event. Even extracts from Upper Clyde Shipbuilder's hero Jimm Reid's speeches will be broadcast across the water."